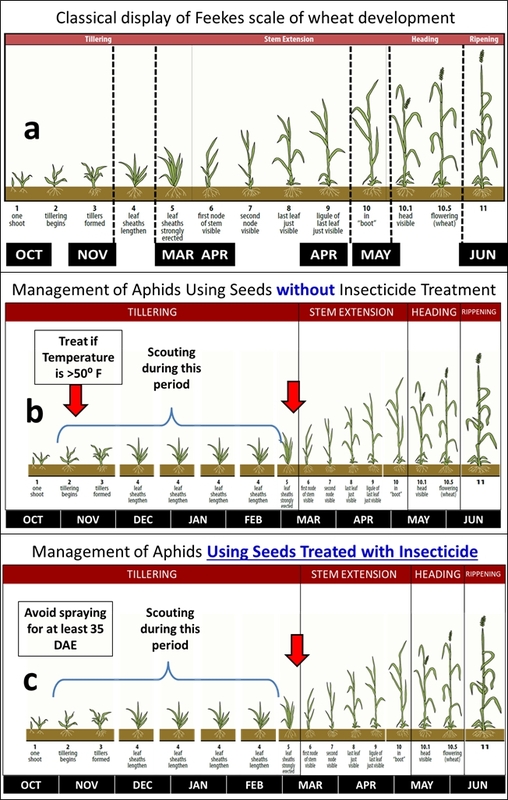 Insecticide spray programs for aphid management should follow integrated pest management practices instead of calendar-based programs. In Kentucky, the rest of the USA, and many other parts of the world, calendar-based insecticide programs continue to be used due to ease of implementation, time constraints for scouting, and economic savings achieved by reducing trips across fields. The bird cherry oat, English grain, greenbug, and corn leaf aphids are the most important species in Kentucky wheat fields. They are the key pests on wheat grain production for their role as vectors of Barley Yellow Dwarf Virus (BYDV). Bird cherry oat and English grain aphids overwinter as nymphs or adults, and they can start feeding (and potentially transmit viruses) when temperatures are above 45º F.
They start probing plants when temperatures are greater than 45ºF. At constant 50ºF temperatures, these aphids may complete their life cycle in 28 to 30 days, whereas at 77ºF, the life cycle can be shortened to approximately 8 days. Below 45ºF, aphids are inactive, lethargic, and sheltered in soil crevices near the bases of wheat stems. Given the circumstances mentioned above, and considering the harsh temperatures during this winter, farmers in Kentucky should restrict the use of insecticide applications to manage aphids on small cereals. Figure 1a shows the “classical” view of the Feekes scale of wheat development; while figures 1b and 1c show wheat development adjusted to time in months for spraying wheat planted using seeds without (1b) and with (1c) insecticide-treated seeds. In 2018, plants grown without insecticide seed treatment (Figure 1b) should not have been sprayed. However, if temperatures were greater than 50⁰F and the average numbers of aphids were greater than or equal to 3 per foot row, one insecticide spray might be needed by mid-November to early December. Also, an additional spray might be applied in early or mid-March only if aphid tallies show that the mean numbers of aphid are greater than or equal to 10 per foot row. These potential sprays are represented by the arrows in Figure 1b. On wheat plants grown with insecticide-treated seeds (Figure 1c), insecticide sprays should not have been applied for at least 30 to 35 days after plants emerged (DAE). Insecticides on seeds should keep aphids at low numbers even if temperatures were greater than 50⁰F by mid-November or December. In these plants, a spray might be applied in early or mid-March only after tallies have shown that the mean numbers of aphids are greater than or equal to 10. These potential sprays are represented by the arrow in Figure 1c. After the period described above, any growers should consider the threshold (greater than or equal to 10 aphids), and scouting should be conducted for plants grown with and without insecticide seed treatment. To reduce insect pest and manage insecticide resistance, farmers should consider different tools for IPM programs. These include the use of tolerant cultivars, crop rotations, early/late planting to avoid pests, and scouting to monitor pests or the abundance/absence of natural enemies. Insecticides (as seed treatments or foliar applications) should be considered a tool of integrated pest management, rather than the solution to insect pest problems. Finally, when sprays are applied, use the rates established on the insecticide label; lower rates will increase insecticide resistance.